Beidh tú an lá sin ‘do throscadh. Ar an gcuma chéanna, is docha nach mbeadh ach an dea-fhocal le rá aige chomh maith dá scríobhfadh sé faoi Uachtar Ard agus muinntir na háite. Bhí baint eile leis an mbárd–scollóg leis an gceanntar seo: phós sé bean as Doire. Bhí Colm pósta faoi dhó, agus ní fios cé acu den bheirt bhan a tháinig ó Dhoire. Mac amháin a bhí aige agus cailleadh an t-óganach sin nuair nach raibh fiche bliain caite aige. Nuair a chailleadh an dara bean-chéile a bhí aige bhí air dul isteach i dTeach na mBocht. Saor a bhí ann a chum an chuid is mó dá chuid fhilíochta le sult agus caitheamh aimsire a dhéanamh do mhuintir na dtithe ina mbíodh sé ag taisteaal ar fud Conamara ag obair. Tá sé ráite go bhfuair sé cart poitín chomh maith le lóistín oíche as ucht an dáin sin “ An Bás” a scríobh – táilliúir len ar chaith sé oíche i lóistín, uair amháin, agus a raibh ”An Bás” mar leasainm, atá i gceist san dán seso. Ceann de na dánta is cáiliúla dár chum sé ariamh is ea “ Cúirt an tSrutháin Bhuí”, agus is suimiúil an rud é nárbh é féin údar na bhéarsa is binne agus is deise den ceithre bhéarsa déag atá ann, ach Mícheál Ó Clochartaigh, duine dá chomharsan. Rugadh Colm de Bhailís i Leitir Mealláin ar an 2/5/1796, dhá bhliain roimh Éirí Amach 1798. Ina óige bhí muintir na hÉireannag súil le cabhair ó Napoleon Bonapaarte- “ Cuirfimid an Choróin ar Napoleon Bonaparte” an ros catha a chloistí go minic in áiteanna an t-am sin. Ábhar mórtais aige igcónaí gur cuimhin leis go maith an lá a thit cogadh Waterloo asmach. Fear óg a bhí ann i 1829, nuair tugadh saoirse creidimh do mhuintir ne hÉireann. Meán–aosta a bhí sé aimsir an Ghorta Mhóir, agus is ag an am sin, am an ghátair agus an ghanntanais, a scríobh sé an dán cáiliúil úd “ An Gréasaigh”. Mhair sé go dtí tosach na haoise seo. His works were published by Connradh na Gaelige. “Tacar Amhrán” a collection of poetry by Padraic Ó Domhnalláin, a local teacher, contains a poem”Amhrán an Tae” by Colum Wallace. This book was in use in local National schools at the beginning of the century. I am so pressed that I did not get time to send you a receipt for the generous donation of your Craobh to the Colum Wallace fund but you no doubt saw the acknowledgement in “An Claidheamh”. We have failed so far to get anyone in Garumna or in Carrowroe to take Colum. Fr. Brett C.C. has been making enquiries. Would it be too much to ask you to make enquiries as to whether someone could be got in or near Oughterard, or indeed, anywhere. Time is passing and indeed the old man may die any minute. We have now enough money to take him out of the workhouse. If there was only someplace for him to go? Please do your best. What do you think he would say to being placed in someplace for aged people, in Galway or elsewhere? He would, of course, be sure of good care and food there, No doubt he needs, to some extent, invalid treatment. Many thanks for photo which I hope to make use of. I am thinking of writing a short article in English on Colum, to appear along with the photo. I can lay my hands on “Cúirt an Srotháin Bhuidhe” and on “Amhrán an Tae”. Another poem of his is “ An Bás”, which I think has never been printed. Could you get me a copy of this? Indeed I should be grateful if you could send me copies of any poems, long or short, by him that you can get, also any short rhymes, anecdotes, epigrams etc. as well as any incident in his life that has not yet been published. Now is the time to collect all of this. Ina few months it may be too late. 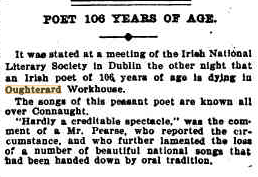 I am sure an interesting article could be written, giving quotations from his poems. Afterwards we might bring out the poems in a little book. Please let me know as soon as possible how you are getting along with inquiries about the house. A second letter was received on the 29. 07. 1903. I am very glad indeed that you have been able to close with Mrs O Toole as regard terms. It relieved me of a great deal of anxiety. I enclose cheque for £3, which I think should be sufficient to fit Colum out respectably and keep him in pocket money for some time. In order to keep everything square I intend to make all payments by cheque. The present cheque I make payable to you. You can change it and give the £3 to Colum. Try, if possible, to complete everything to morrow or next day so that Colum may take up his residence with Mrs O Toole on Saturday 1st. I will send you cheque for £2 for Mrs O Toole on Friday evening. I am anxious s to be able to announce in next weeks “ Claidheamh” that everything is complete and that Colum is now comfortably housed outside the Workhouse. Many thanks for “ An Bás” and “ Cúirt and Srotháin”. I will only quote from them in the article. Would it be too much to ask you to let me know before Monday in what year (approximately) “ Amhrán an Tae,” An Bás” and Cúirt” were composed and also where the “ Cúirt” was and whether it is still standing? You will hear from me again by Saturday morning. I need scarcely say that I am most grateful to you for the way you have helped me throughout. But for you, it would have been quite impossible for me to carry the matter through. 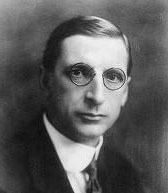 As a result of the correspondence with Padraic Ó Domhnalláin an article on the life of Colum Wallace appeared in Padraic Pearse’s paper “ An Claidheamh Soluis’ in August 1903. Gearóid Dennvir NUIG Galway published a book in 1996 entitled “ Amhráin Choilm de Bhailís”. 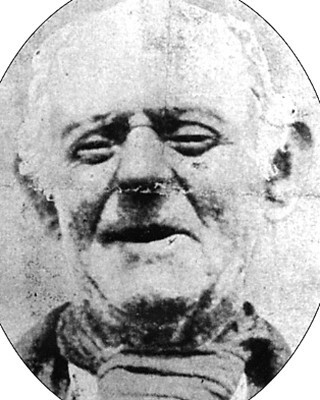 When Olive Breathnach wrote her article on Colm Wallace’s life in 1984 people believed that Colm was buried in “Teampaillín” the Workhouse Graveyard. This page was added on 23/08/2010. I am very appreciative of your research on Colum de Bhailis and want to thank you for that. The events annually held which I have observed from a distance as in California honoring Colum have been marked by me as special. I hold a very special family connection with Colum de Bhailis. 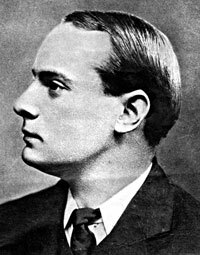 After all Padraic O Domnaillan I believe my second cousin or first cousin once removed however that is defined taught Irish to both DeValera and Padraic Pearse. That has never been mentioned. My mother always claimed by the way that his last name was Persse!!! She claimed that Padraic O Domnaillan gave him the name McPiarais! It was he who made arrangements with Mrs O’ Toole to take on Colum.Just Sayin!! Glad to read your piece about Colm a’Bhailis. Mrs O’Toole (nee Healy) in the Main St. was my great grandmother. My mother often told me about Padraig Pearse calling in to O’Toole’s to converse with Colm a’Bhailis but I thought it was just a family legend.